Aruna is an internationally recognized expert in teaching kids yoga and a sought after speaker and trainer around the world and locally in Ontario, Canada. She is the author of the online kids yoga teacher training programs The Frog Yoga Alphabet Games and Manual, Yoga Man vs. The Stressor: Yoga for Boys Games for Stress Reduction, founder of Young Yoga Masters Kids Yoga Teacher Training and co-founder of Ambassador Yoga 200 HR Yoga Teacher Training. Aruna is read by thousands of new and experienced yoga teachers through the Young Yoga Masters blog. Aruna has been teaching yoga to kids of all ages for over 20 years. She’s taught every age group from toddlers to teenagers, moms and tots, family yoga, and adult/child yoga. She led weekly after school classes in the pre-school, kinder, junior, and senior school age rooms at a daycare for 10 years. Aruna has also taught yoga at kids camps, yoga studios and schools across Canada. Now, Aruna’s focus is on training kids yoga teachers and helping yoga teachers deliver profitable yoga teacher training programs through the Ambassador Yoga Train-the-Trainer. She specializes in interactive presentations and workshops for teachers at schools and conferences both locally and internationally. Presenter/Speaker: Yoga Conference Toronto, National Kids Yoga Conference Washington, YogaPalooza Toronto, Kids Yoga Training/Workshops: Pennsylvania, New Orleans, Ontario, and hundreds of other schools, daycares, and festivals. Hi, I’m Aruna and I write the Young Yoga Masters blog with a focus on tools for kids yoga teachers. I’m also co-Director of the Young Yoga Masters Kids Yoga Teacher Training and the Ambassador Yoga Teacher Training for Teens, both Yoga Alliance registered schools. Thanks for taking a look around the website. Here’s a little about my background. It may be a surprise to anyone who knew me as a child that I’m a yoga teacher. You see, I was never an athlete in school and I’m just going to chalk that up to being a November baby, so, much less coordinated than most of my peers. The only teams I was on in grade school or high school were outside the gym, like the math team and the school newspaper. I was a bit of a party girl too. Still, I graduated from University with an Arts Degree in 1990, to the delight of my parents, but never really knew what I wanted to do. Drawn to a life of service, I found my first full-time job working with homeless women at an overnight shelter then branched out to work with street youth and adults. Then one day my life turned upside down when I was assaulted on the job. It was a difficult time because I was under the mistaken belief that I was immune from violence against women. It led me to rethink a lot of things in my life. I needed to find solid ground to stand on again. You can read more about that traumatic time of my life at this link. Here I’m giving a speech about poverty issues at International Women’s Day in Convocation Hall, Toronto, 1995. It was actually by accident, I joined the local gym to take aerobics, but the loud music was just too much for me. Someone suggested trying the yoga class. Wow! I found a way to get in shape and to deal with all the stress I was going through. Yoga became the favorite part of my week and I went to every yoga class the gym offered. I remember riding my bike to yoga one day and whistling while I peddled. It surprised me because it had been a long time since I had been spontaneously happy like that. I’ve been hooked on yoga ever since. I’m so grateful for all I’ve learned through yoga, it led me out of a dark place and helped me find my whistle! I had courage enough to start living my life again and now I finally knew what I wanted to do – become a yoga teacher. My two dear friends, Nirmal and Daya. 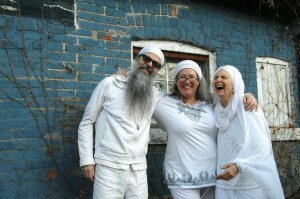 We do Kundalini Yoga retreats together to keep up our yoga practice. In 1998 I became a certified Kundalini Yoga teacher (as taught by Yogi Bhajan) and began teaching yoga. From 1999 to 2005 I lived in the Guru Ram Das Ashram in Toronto and immersed myself in the yogic lifestyle living under one roof with 15 other spiritual seekers. In 2000 I accepted the position of Ashram Manager (read: unplugged toilets, mediated arguments, and sat on committees when people wanted to move in listening to questions like: If you were a tree, what kind of tree would you be and why?). What a trip. I met the love of my life in a meditation group and we married in 2005 and that was when I moved out. Though I still teach yoga at the Ashram in Toronto because it is such a special place to do yoga. In that meditation group, I also met a Meditation Master, the author of Ancient Secrets of Success for Today’s World, Tulshi Sen. Mr. Sen became a mentor for me to think BIG using spiritual principles, another gift I am so very grateful to have received. Back in 1998 I began teaching kids yoga at the request of my friends. My lessons were based on my own imagination and any kids yoga books I could find to get ideas (they were not that easy to find back then). In 2004 I took the Radiant Child Yoga Program and loved it. These tools were effective, but after five years of teaching kids, I was getting burnt out and felt the deep desire to take kids yoga beyond animal yoga poses and games. This was how the Young Yoga Masters Teacher Training began. It allowed me to keep teaching by incorporating meaningful philosophy into my teaching. I developed a new Kids Yoga Teacher Training with an emphasis on child friendly yoga philosophy and began teaching it as a weekend training, now the Themes and Dreams module. This training has been tested in countless schools, daycares, community centres, and studios and is my favorite way to teach real yoga to kids. I also started blogging about Kids Yoga in 2007. There was no other blog I could find dedicated solely to kids yoga, so I started it myself to build community. I connected with many other wonderful teachers this way. In this video Aruna is featured at the 2:23 – 6:50 min mark. Through all of this I’ve learned how important community is and love to find strategic partners to bring more yoga to the world. The Kids Yoga Teacher Training has expanded, with the help of Janet Williams from Children’s Yoga Books, and meets all the Yoga Alliance requirements for 95 hours of training as a Registered Children`s Yoga School. And now that so many of the kids I first taught in 1998 are now adults, I’ve spotted the need for children’s yoga to grow with children and have started the Yoga Teacher Training designed for teens with the help of Claire Matthews from Yoga Truly. This new 200 hour training is called Ambassador Yoga, and if you’d like to join our team and become a teen yoga teacher trainer, take a look at the program at this link. That’s Janet Williams on the left with me at our A Children’s Yoga Network booth at the Toronto Yoga Show. We co-direct the 95 Hour training together. Currently, most of my focus is on training new teachers around the world and in person, both on-line and live Teacher Trainings. I still teach a few kids classes in Toronto, Canada in a Montessori School and one weekly Kundalini Yoga class for adults (adult classes are so pleasantly quiet after teaching kids!) at the Ashram where I used to live. This gives me lots of opportunities to test all these yoga tools on real students. Plus it’s fun. I remember laughing at someone who was using a spiritual name when I was in University. Little did I know I would be one of “those people!” I received my first spiritual name when I made my Confirmation in the Catholic Church when I was in grade seven. I chose the name Anne, who was the grandmother of Jesus (but I was also influenced by the spunky Ann of Green Gables). Yogi Bhajan bestowed the name Santokh Kaur in 1998 which means “princess of patience and contentment.” Was this foreshadowing for a future in kids yoga? A spiritual name helps one understand their path and destiny in life. Meditating on myself in all these capacities has helped me grow. If you’ve made it to the end of this long bio, thank you for taking the time to read my story. I’m sure your story with yoga is an interesting one and I hope one day we have the chance to share it. To see my current schedule of public classes click here. For information on having a private consultation about your kids yoga questions click here. If you have any questions about Kids Yoga or are interested in booking a Young Yoga Masters training in your area, please feel free to contact me. The Frog Yoga Alphabet is used in the Yoga Literacy Teacher Training and also available as an online training.